An act of negligence resulted in the death of a 6-year-old boy in a posh residential colony in Hyderabad's Narsingi area after he was electrocuted on coming in contact with a lamp post. The police said that the incident happened at around 6:15 pm on Monday. 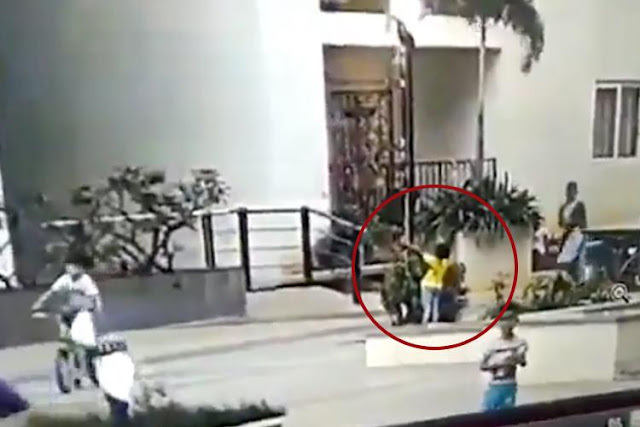 A horrifying video from the CCTV footage of the gated community shows the child playfully grabbing the post and swinging around only to receive a massive shock. He then gets attached to the pole due to the electricity passing through it. For several minutes, the boy remained stuck to the pole as several residents of the colony walked by unaware of what was happening. The police said that there were around 10 such lamp posts in the colony and the pole that the child came in contact with, was right in front of the block where he stayed with his parents. "After around 4 to 5 minutes, he got detached from the pole and fell down following which another child noticed him and alerted the security guard. The guard also received a minor shock when she tried to touch him," Sub Inspector K M Raghavendra from Narsingi police station told TNM. The police official also said that people in the locality tried Cardiopulmonary resuscitation (CPR) but the child had already lost his life by then. "At around 6:45 pm they took him to a nearby hospital where doctors declared him brought dead. The police were informed about the incident at around 8:40 pm following which a case was registered under Section 304A (Death due to negligence) of the IPC," the SI added.